This past month, Reno hosted the “Prospectives 09” festival, directed by Joseph DeLappe, Associate Professor of Art in the Digital Media area at the University of Nevada, Reno (UNR). The festival featured the work of 37 international artists and performers who are all current graduate and PhD candidates, working in various modes of digital practice. 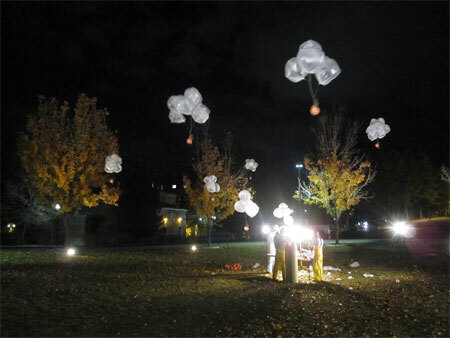 There were exhibitions, performances, a curated collection of internet art, symposia, video projections at UNR’s planetarium, and even a nocturnal array of illuminated floating pig bladders (a work by Doo-Sung Yoo, whose Pig Bladder Clouds references human-animal hybrids). It would be a fool’s errand to try and propose some overarching principle that would legitimately tie together such a broad expanse of work. Limiting myself to the works on display at the “Prospectives 09” exhibition in UNR’s Sheppard Fine Arts Gallery, it seemed there was a common desire to enlist the spectator as a participant. Open until December 16, 2009, the works included in the show involved a fair amount of “play,” but the artists seemed attuned to the complexities involved with the interaction between machine and participant, thus it’s play inflected with critique. 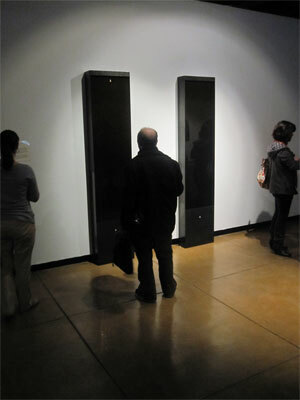 John Walters’ interactive sculpture Waste Oil Mirror I & II (2008) is stately, beautiful and troubling. Two black rectangles stand against the wall, each seven feet tall, at first glance as minimalist as the monolith from Kubrick’s 2001. Triggered by the body heat in the gallery, a mechanical purring noise starts, and a soft gliding motion comes over the surface of the obelisks. The sculpture then draws up used motor oil from a reservoir at the bottom of the obelisks, cascading a film of oil over the front. The oil reaches downward like a glossy bouquet of fingers, each pendulous drip a digit, until the length of the surface unruffles into a smooth black reflective plane. The work is a sort of pun on the notion of “oil dependence,” making the viewers rely on a mirror of industrial waste for an image of themselves. Jonah Brucker-Cohen’s Alerting Infrastructure (2003) is also set into motion by visitors, although only “virtual” visitors. Whenever the “Prospectives 09” website gets a unique visitor hit, a signal is sent to a pneumatic jackhammer that’s trussed to an interior wall of the gallery, and the jackhammer chips away at the wall. It’s a witty commentary on the cost of exposure, and the erosion of the “local” by the tides of the “global,” though what I like best about the piece is how it conspires to put online visitors in the position of mindless vandals. When I came by, the jackhammer was silent, though as it turns out, it wasn’t because the “Prospectives” website lacked visitors. Someone had hacked into the website in such a way that the hit counter was registering an endless succession of hits, sending the drill into a perpetual destruction mode: the gallery decided to cut the cord. In this unforeseen set-up, “cheating” has consequences that aren’t just ethical, they’re architectural. Another cluster of work in the gallery could be loosely grouped together as “art games.” Jason Nelson’s i made this. you play this. 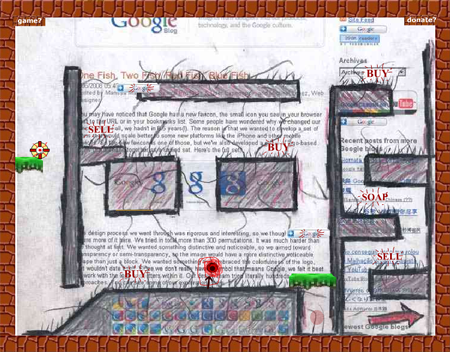 we are enemies (2008) has a pleasingly scribbly aesthetic, taking the studiously art-directed pages of popular websites, including Yahoo, Disney, Metafilter, and Boing Boing, and converting them into game levels, messily drawing mazes and obstacle courses over them with the rough abandon of a kid with a coloring placemat and a fresh set of crayons. 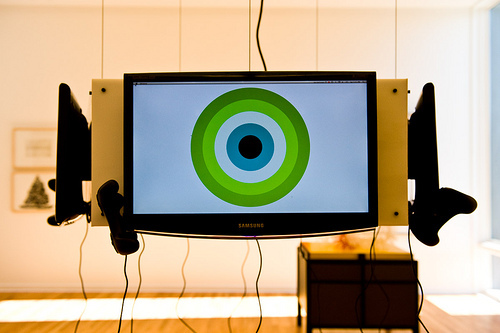 In the game, with the screen projected in a large format on the wall, you maneuver your avatar - a cross between a target and a bloodshot eyeball - with basic arrow and “jump” keystrokes. The text on the webpage backgrounds is broken up by the mazes, sometimes truncated into an off-kilter poetry. Nelson has added his own text, with brief lines like “can links be translated?” The gameplay isn’t challenging at all - it functions more as a delaying tactic, to give you some time to absorb the defacements and the scraps of poetry littered along the route. It’s a reading experience disguised as a game experience. Samson Young’s RPG Triptych, Panel 1 (2009) also uses a game interface to parcel out a sequential experience, though in this case the player moves through an absurd, cartoonish storyline, where cryptic information is dispensed by anime nuns, and magical crystals turn out to be made of salt. Along the way, you can change your hair color, and transform yourself into a wooden cart, speeding along a train track suspended over an infinite abyss studded with stars. The task-oriented nature of game-playing has been blunted into a series of nonsensical dreamscapes. Lastly, Joshua Fishburn’s Gaming the Network Poetic (2009) links five games in a rosary of G5s, the monitors arranged in a pentagon. The clean vector design of each of the games is very appealing; simple geometric shapes recur throughout the games, serving separate functions. In one game, you click to break a square apart into smaller squares; in another, you try to attach little hinges onto drifting triangles, so that they swing together to form squares. Five people are meant to play the games simultaneously, with the activity of one game influencing the others - I have to confess, some of the connections escaped me. Perhaps this was the one piece in the exhibition that, while it invited participation, didn’t really need it. The five G5s could rest alone in the empty gallery, talking obscurely among themselves about the subtle relations between squares, triangles, and other geometry. “Prospectives 09” runs through December 16, 2009 at the Sheppard Fine Arts Gallery. The curated collection of internet art can be accessed through the “Prospectives” website. Chris Lanier is an animator, cartoonist, writer and new media artist. He is an Assistant Professor of Digital Art at Sierra Nevada College.